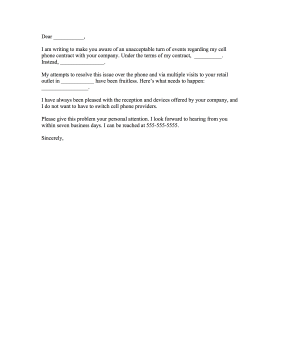 This printable complaint letter requests a replacement cell phone. I am writing to make you aware of an unacceptable turn of events regarding my cell phone contract with your company. Under the terms of my contract, __________. Instead, ________________. My attempts to resolve this issue over the phone and via multiple visits to your retail outlet in ____________ have been fruitless. Here's what needs to happen: _________________. I have always been pleased with the reception and devices offered by your company, and I do not want to have to switch cell phone providers. Please give this problem your personal attention. I look forward to hearing from you within seven business days. I can be reached at 555-555-5555.